The UMass Kinesiology Club was formed to serve as a link amongst students both in and interested in the Kinesiology major; to organize and attend events of interest; to create networking opportunities amongst students and faculty; and to reach out to local communities to make connections between their residents and UMass Amherst. You do not have to be a Kinesiology major to join, all are welcome! 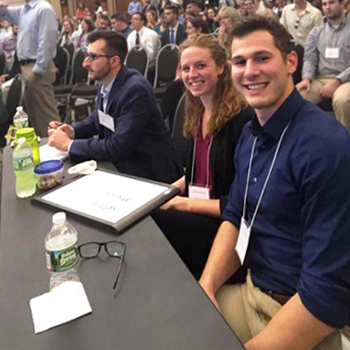 Our club attends the New England College of Sports Medicine (NEACSM) Fall Conference, hosts an annual charity dodgeball tournament, and invites numerous guest speakers, from various health-care professions to provide professional advice and talk about their experience. We also hold information sessions about graduate schools and connect students with UMass Kinesiology Alumni. Contact Co-Presidents Lauren Zarro and Samantha Foster at umasskinclub@gmail.com to join! Visit the visit the Kinesiology Club page on Campus Pulse or the Kinesiology Club Facebook page for more information and details about current events!